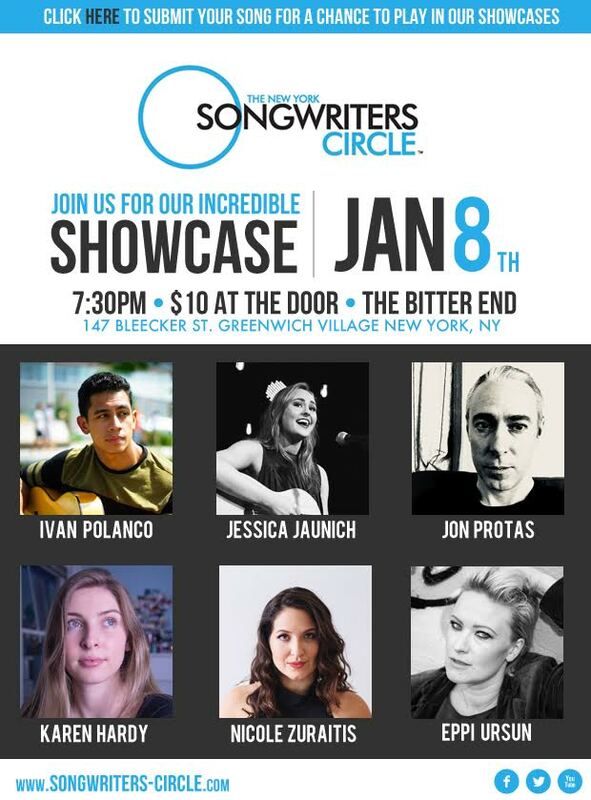 Join us Monday January 8th for our award winning showcase! Our first showcase of the 2018 season features 5 stellar acts and one international guest! Karen Hardy is an up and coming artist and songwriter from East Brunswick, New Jersey. In September of 2017, she took her soulful pop originals down to Nashville, TN to spend more time writing and learning from some of the best. Jon Protas believes in the purity of a well crafted song and the superiority of grade B maple syrup. He divides his time between Brooklyn and Vermont, and is grateful to be a part of this evening at the Bitter End. Brooklyn based singer songwriter nicole zuraitis has performed, lived and loved in New York City since 2009. Since her arrival she’s held residencies at the 55 bar and Redeye Grill, headlined the Blue Note and toured internationally with Livingston Taylor, Tom Chapin, Dan Pugach Nonet and Elise testone. She loves pitbulls, coffee, milk chocolate and wine. Ivan is a Independent Music Artist based out of White Plains NY. With four albums of original music online, five New York college tours under his belt, and a YouTube channel with over 200,000 video views, Ivan has been catching the attention of listeners with his unique pop / r&b sound. Currently prepping for a his first Northeast tour and his fifth album release in 2018, Ivan is excited to share his new music with audiences. – Jessica Jaunich was born in Minneapolis, Minnesota and began dancing at the age of 3. By the age of 8 she started competing at Larkin Dance Studio in Maplewood, MN where she continued training until she graduated high school. Jessica continued on to the University of Minnesota and was a member of their 15 time national champion dance team. While on the team, Jessica won 3 national titles and a gold medal competing on Team USA dance. She also enjoys writing music and is very passionate about singing. Jessica is excited and fully committed to making her dreams a reality through hard work and dedication. – Eeppi is a singer-songwriter from Finland who has released three solo albums. In addition to her solo career Eeppi is often seen as a soloist with various groups and projects. She is also known for her collaboration with a cappella group Club For Five and as a composer and arranger in many theatres. Eeppi’s musical style is inspired by pop and jazz, rich harmonies, melodies and she loves big and catchy refrains.